Elena Gilbert is once again at the centre of magic and danger beyond her imagining. And once more, Stefan isn't there to help! Elena is forced to trust her life to Damon, the handsome but deadly vampire who wants Elena, body and soul. They must journey to the slums of the Dark Dimension, a world where vampires and demons roam free, but humans must live as slaves of their supernatural masters. 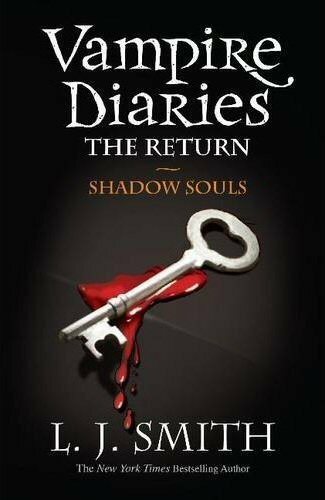 Damon's brother, the brooding vampire Stefan whom Elena loves, is imprisoned here, and Elena can only free him by finding the two hidden halves of the key to his cell. Meanwhile, the tension between Elena and Damon mounts until Elena is faced with a terrible decision: which brother does she really want to be with? The drama, danger and star-crossed love that fills each Vampire Diaries book is in full effect here, with Elena Gilbert once again filled with supernatural powers. You would think an author would improve with time, but Smith has managed to grow worse. The overall story actually has faint hints of having could have been a good one (heroine, bad boy and friendly sidekicks go to hell to rescue lover boy). However it was written so poorly and feels so fragmented that this has got to be one of the worst books I’ve ever read. Pages upon pages are spent on how Elena, the main character, feels and thinks and it is just way too much. Bad boy Damon, who previously alternated between flirting heavily and being mean to her, has now fallen properly in love and she loves him back in order to save his soul... or something like that. You see, what Smith seems to find highly amusing is to only vaguely describe what may or may not have happened and why and thus, I literally cannot tell you the exact details of this book as I simply do not know them. The two accompanying sidekicks, Elena’s best friends, Bonnie and Meredith are purely there to be there and just listen to every word Elena has to say and find her amazing – they are the sisterhood of Velociraptor. (No, I did not just make that up, it really says so in the book, and yes, a velociraptor is a dinosaur). Hell is a place where demons and vampires hold human slaves (and few humans are rich enough to be free), and of course the lovely all righteous Elena is having none of that! So of course she manages to get whipped to save a female slave, who happens to be extraordinarily rich, if someone could just help her and badabing, badaboom, they're all living in former lady-turned-slave's mansion. The lady also happens to be an extraordinary seamstress so when the three girls and vampire Damon have to go to balls on their search for keys (because of course they do), they get to wear fancy dresses. Smith spends so many pages on explaining these gowns in full detail that I started just skimming till something actually happened again as you can only take so much glitter and velvet till your head explodes. They do eventually get around to saving lovervamp Stefan and make a run for it home. Like in book 5, this all have to do with the Japanese demon characters, which in the mean time have made a playground of Elena's town and so by the ending of book 6, they have in fact gotten absolutely nowhere and the big inevitable facedown is still to come. I apologize if the above seems like a massive rant, but at the end of the day, I cannot find a single proper good thing to say about this book, and as a result, I give it zero stars. Wow. Harsh. I was thinking about reading this series, but thank you so much for posting this. This has made me aware of how the series ends.